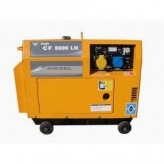 The CED6500XE is a Electric and Recoil Start carry frame mounted generator. 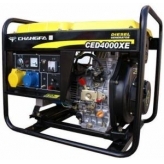 4.6kw Continous 4.9kw maximum load. Long run 12.5 litre fuel tank for up to 6.5 hours approx use. The unit is powered by a CF186F 4 stroke direct injection diesel engine with large air cleaner and exhaust silencer. 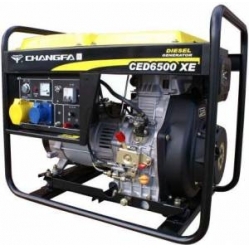 It is supplied with 1x 230v and 1x110v 16amp Industrial sockets and also a 12volt 8.3amp DC outlet . 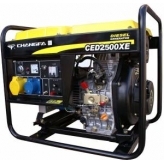 Mains power is protected by a circuit breaker and also fitted with a volt meter.